Ji Chang Wook and Yoo Ji Tae are stirring interest for being at the same place but with a different look in their eyes in “Healer”. 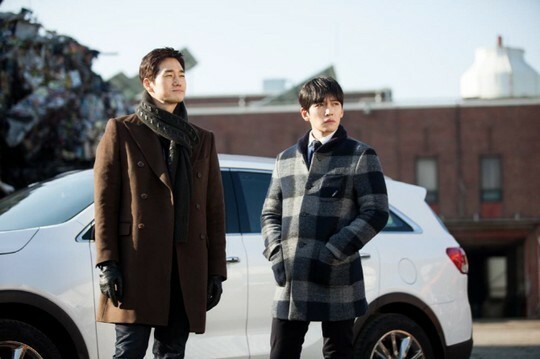 Stills of Ji Chang Wook and Yoo Ji Tae visiting the car junkyard in “Healer” have been revealed. The car junkyard that the two of them visited was handed down to Kim Moon Shik from his parents and was used as a secret hideout by the five friends who ran the pirate radio station, and the place holds special meaning to the two of them. Although they are looking at the same direction in the pictures, Ji Chang Wook and Yoo Ji Tae show very different expressions. As though recalling vague memories, Yoo Ji Tae wears a slight smile on his face, but Ji Chang Wook does not seem to show any particular interest and stands there with a grouchy look on his face, stirring interest from audiences. In episode 11 to be aired on 12 January, Moon Ho intends to make use of Jung Hu, but Jung Hu accepts his suggestion in order to clear his father’s name of the false charge. Tonight’s broadcast is receiving warm interest from viewers as to what could be Moon Ho’s reason for bringing Jung Hu to their parent’s hideout. ← [Review] Healer: Half Time!